Wheeling Decorating Company located in Wheeling, West Virginia, decorated glass, pottery and porcelain with gold and enamels, engravings and lithographs from 1900 to 1962. 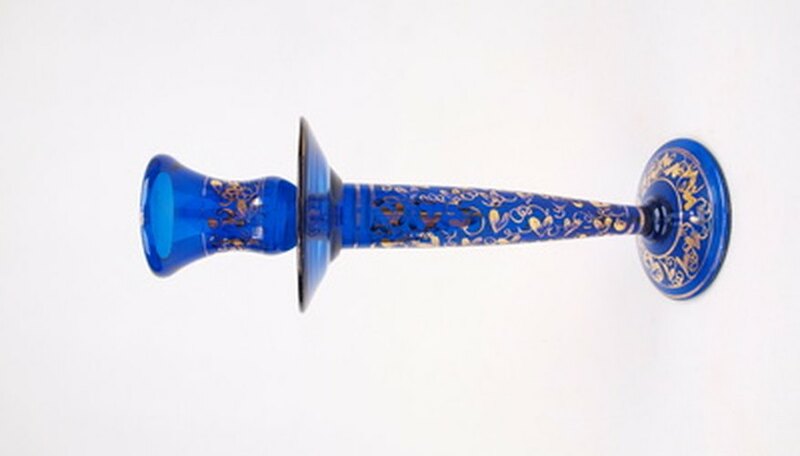 This company did not make glass but decorated glass for elegant glass makers such as Duncan-Miller and Heisey. A large body of the Wheeling Decorating work was in the church plate industry, and church plates are often marked with a horizontal diamond logo or a stamp with Wheeling Decorating Co. in writing. Decorated glass is much more difficult to identify, as it was not marked. Look for all-over-patterns (AOP) like Pickard made. The early designs were gold-encrusted and formal, and look much like Rose and Daisy by Pickard. D-11 is one of the most common early patterns identified by doves nestled in the flowers. Much of the early work of Wheeling Decorating Co. covered the entire piece with gold, with a tiny design visible in good lighting. Find enamel patterns from the 1930s and 1940s. Wheeling Decorating Co. made more casual designs in the middle years of their production. Sporting, athletics and bird glasses were some of their popular products and many were hand-enameled. Later years saw more decal designs and less handwork. Expect familiar shapes. Wheeling Decorating Co. had contracts with Duncan-Miller and Cambridge, according to James L. Webster in the book, “Wheeling Decorating Co.: Identification & Value Guide.” They also decorated the candlewick shapes made by Imperial Glass as well as some of the Heisey and Dunbar blanks. They may have also used West Virginia Glass blanks for some decorating. Determine value of Wheeling Decorating Co. glass by condition, quality, scarcity and desirability. Condition is always a key element in glass values, and the condition of the gold decorating is important. Rim losses are common and gold loss decreases the value of these items. Etched patterns are more desirable than gold applied over the glass, and hand-painted enamels are more desirable than gold alone. Common patterns like the three-leaf pattern on Libbey stems are available for less than $10. Sets of etched and decorated glass plates sell for hundreds of dollars.